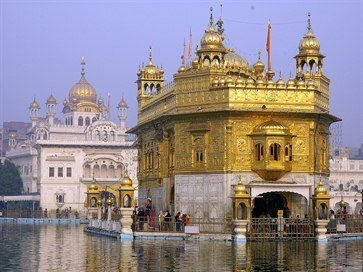 After reaching Amritsar Check In hotel and taking breakfast proceed to First to Golden Temple in the morning. From there City tour cosists of Jalianwala Bagh A historical monument that tells the sad story of mass killing during the independence movement in India, Here lies the memorial of the martyrs of the 1919 massacre by British General Dyer. From there you can visit Durgiana Mandir. By late afternoon proceeds to visit India-Pakistan border, which is also known as Attari(India)-"Wagah" (Pakistan) Border. A visit to the border is an interesting experience, especially at sun-set, when the retreat ceremony takes place with the Border Security Force (B.S.F.) on the Indian side and The Sutlej Rangers on the Pakistan side putting up a well co-ordinated and spectacular display which compares very favorably with the changing of royal guard in London. By late evening you will return to your hotel from there you can visit the golden temple in night or you can rest in the hotel. This morning after breakfast proceed to Katra. Upon arrival check into your hotel. Rest of the day is at your leisure.At Night You may proceed for a 13 km trek by foot Or by Palki/Horse to reach Vaishno Devi Temple to have early morning Darshan of Mata Vaishno Devi. Or you can rest in the hotel & Enjoy the greet mountains spectacularly beautiful of katra. overnight in hotel. This morning after breakfast proceed by walk start 13 km trek by foot. Or by palki/horse to reach Vaishno Devi Temple to have early morning Darshan of Mata Vaishno Devi. After having Prasad proceed to Bhairo Baba Temple. The journey to the Holy Shrine of Shri Mata Vaishno Devi Ji starts with the Call of Mata. It is not only a belief but also a strong experience of one and all that the Divine Mother sends a call to her children. And once a person receives it, wherever he is, is bound to visit the Mother to receive Her unbounded love and blessings. There after proceed to katra by walk. Overnight at Katra. This morning after breakfast drive to Srinagar via patnitop enroot you can see some breath-taking views of the Greet Himalayan mountains through out the journey. Upon arrival check into your hotel/houseboat. Rest of the evening is at you leisure. About Srinagar is located in the heart of the Kashmir valley at an altitude of 1,730 m (1530 feet) above sea level, spread on both sides of the river Jhelum. The Dal Lake enhances its picturesque setting, while the changing play of the seasons and the salubrious climate ensures that the city is equally attractive to visitors around the year. This morning after breakfast visit The City Of Srinagar. The world famous Mughal Gardens visiting the Nishat Garden known as 'Garden of pleasure' built in 16th century (1633) by Mughal Emperor Asif Khan. Then visiting Shalimar Garden known as 'Garden of love' built in 16PthP century (1619) by Mughal Emperor Jahangir for his beloved wife Noor Jehan or (Mehr-un-Nissa) The Chasme Shahi Garden and then pay visit to famous Shankaracharya Temple situated on top of Hill where you can have a look of whole Srinagar City. In the Evening Shikara ride on The Dal Lake to enjoy the beauty of the Charchinar, Floating Gardens & The God has graced this city with, which is often compared to Venice. You will get view of some very interesting places around the Lake. Overnight at Houseboat/Hotel. This morning take a full day excursion to Sonmarg, passing through the spectacularly beautiful sindh valley and picturesque villages. Enroot you may stop at many beautiful spots. Continue drive to Sonmarg 2690 Meters (Meadow of Gold). In Sonmarg One can ride on horse to visit Thajiwas Glacier where snow remains round the year. Sonmarg is known as Gateway of Ladakh.it also serves as a base camp for Amaranth yatra. In the evening return to Srinagar. Overnight at Houseboat Or Hotel. This morning after breakfasts precede to Gulmarg the most beautiful Summer resort It is also popular for its highest golf course in the world & greet mountains surrounded & famous for skiing during the winter season. One can have Gondola ride (cable car) from Gulmarg to Khalinmarg. or Horse riding. A Greet winter Destination for honeymoon lovers. Gulmarg spellbinding beauty with its attractive meadow of flowers allows one to understand why Kashmir is called paradise on Earth. At end Remained a favorite hill resort of the romantic Emperor jehangir. Tourist Love this palace. Back to Srinagar. This morning after breakfast drive to Pahalgam 2440 Meters (Vale of Kashmir), Enroot you will visit The Awantipura ruins, Saffron fields One of the most beautiful places on earth, the town of Pahalgam offers breath-taking views. Pahalgam is also the entry point for the famous Amaranth Cave, a holy site for Hindus. Upon arrival check into your hotel. & After lunch enjoy the nature charm of the valley. Overnight at Hotel in Pahalgam. This morning after breakfast you will proceede to Jammu. Upon arrival you will be drooped at your place. In case you want stay on the way or at Jammu same can be arranged for you. For 01 Night Stay in House Boat Rs 400/Head Extra. We also can arrange Train Tickets for your Kashmir Trip from Any other parts of India as for your Covenient. Tour Packages from Kolkata to Kashmir include Train Fare in Sleeper Class Ex Kolkata.